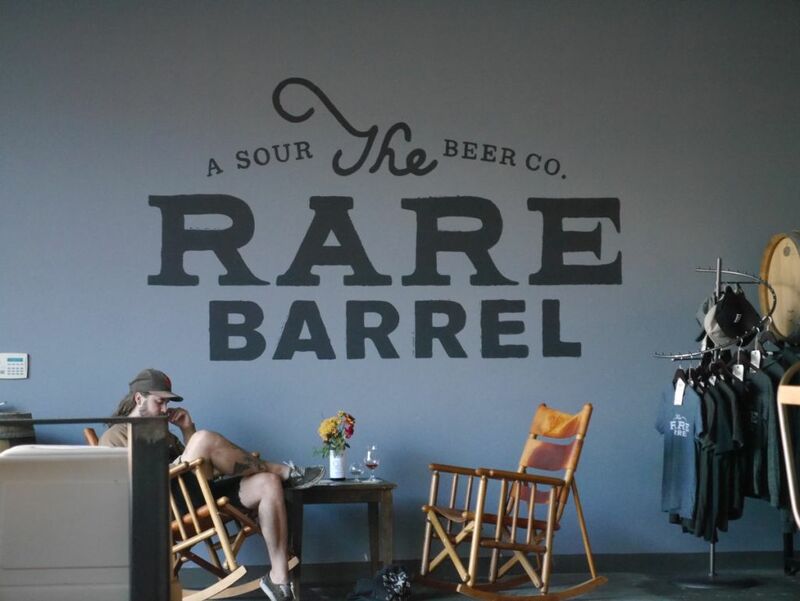 Only a few miles from The Rare Barrel is Fieldwork, another fairly new brewery in the area. 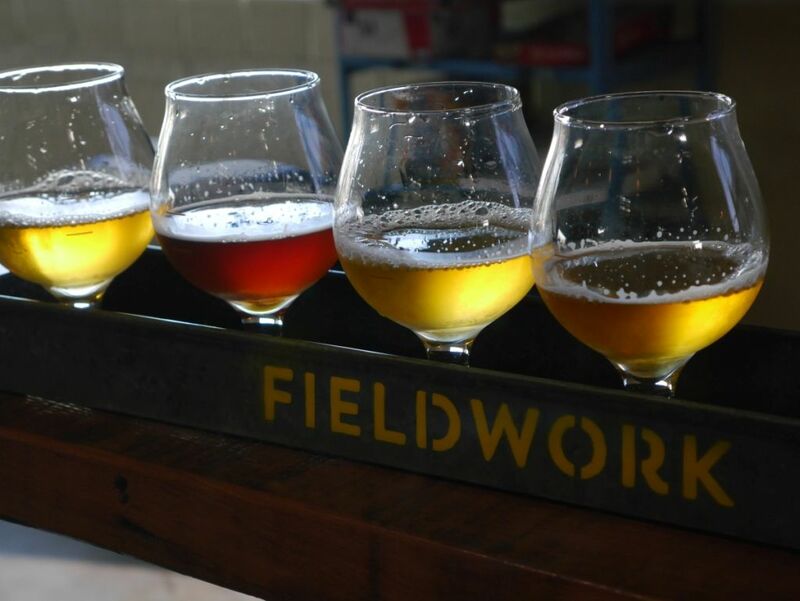 Fieldwork is similar to Cellarmaker though they have a few different styles on tap that I didn’t see at Cellarmaker. Their hoppy beers are similar to Cellarmaker in that they are mostly low on the malts and focus on the hop aroma. 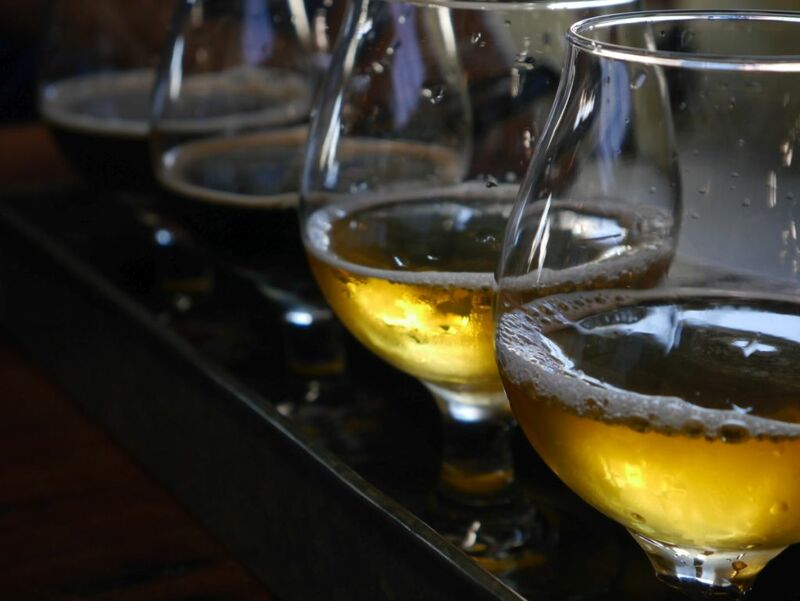 They also serve a number of solid dark beers, and have a great atmosphere at the tasting room. Nice open space of the tasting room. I tasted a total of 10 beers while I was there. 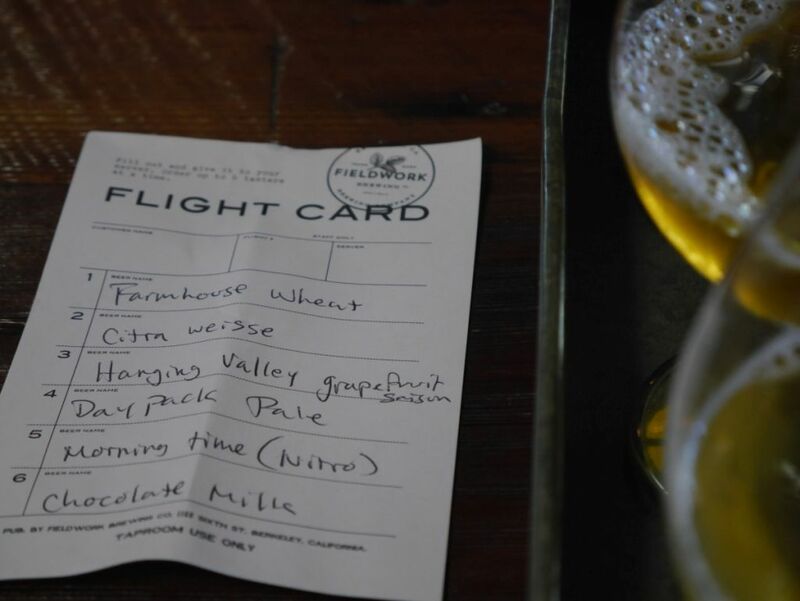 The first flight contained the Farmhouse Wheat, Citra Weisse, Hanging Valley grapefruit saison, Daypack Pale, Morning Time (on nitro), and Chocolate Milk. 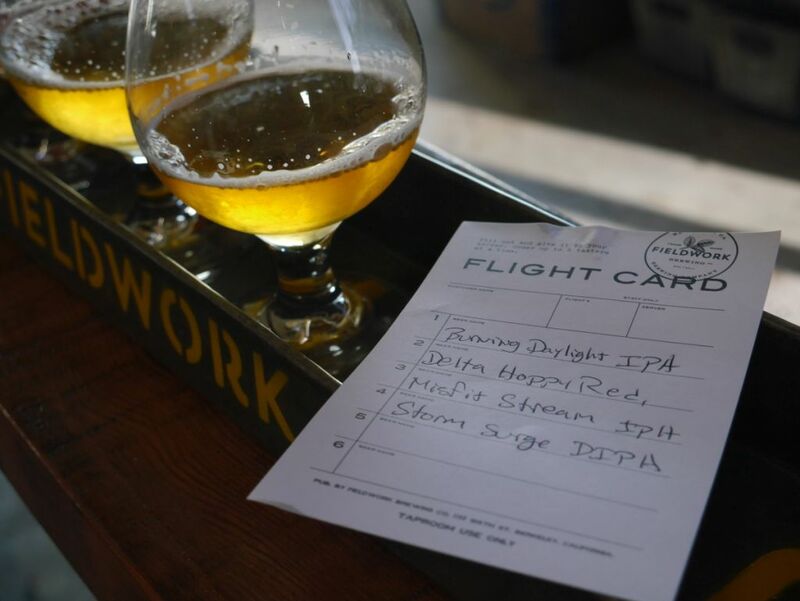 The second flight included the Burning Daylight IPA, Delta Hoppy Red, Misfit Stream IPA, and Storm Surge double IPA. There were a couple of beers I didn’t taste when I was there because the price of the taster was higher than I wanted to spend (the bourbon barrel aged imperial stout was $5 for a taster). Full tap list when I visited. The Farmhouse Wheat was a crisp saison with belgian spices and a super light color and body. I found it had a strangely silky mouthfeel and was more thin than the average saison. It didn’t taste like any saison I’ve had before, though it was still a solid saison. By contrast the Citra Weisse berliner weisse had a seriously off-putting vinegar taste in the back end accompanied by a lemon kick from the hops and light amount of salt. Though this may be to style I had a hard time finishing the taster, though I did ultimately finish it. The grapefruit saison was thicker than the Farmhouse Wheat and had a nice grapefruit finish. Though I thought it was better than the first two, it had a bit of a soapy after taste/mouthfeel. The Daypack Pale ale was a really nice low malt bill pale ale with a citrus/herbal hop character. It was so light that I might have confused it for one of the saisons if I wasn’t smelling the hops. This is a very solid pale ale and gave me a good taste for the delicious IPAs to come later. The Morning Time coffee stout on Nitro had a nice nutty coffee flavor, though slightly acidic. It was nice and light body and very smooth on nitro. This was a very nice beer though it got overshadowed by the Chocolate Milk. Chocolate Milk was a smooth brown ale with a delicious milk chocolate flavor and a light body. I loved how it wasn’t too sweet. I might have left with a liter growler of this one if I had an extra blank growler with me but I didn’t want to buy another screw top growler and that was all they offered. Close up on the first flight. The Burning Daylight IPA was a light color IPA with a smooth citrus and herbal hop profile with a nice bready malt background. A nice solid IPA. The Delta hoppy red was an interesting mix between floral hops and coffee, with a medium bitterness and smooth caramel malts on the back end. Everything mixed together nicely and made for a solid red ale. The Misfit Stream IPA was deliciously fruity with bright pineapple and juicy melon. This IPA was quite smooth and lightly sweet, one of my favorite of the bunch. I might have gotten a growler of this one as well, though I already filled my blank growler at Cellarmaker. I did end up getting a half pour of it though after I was done. The Storm Surge double IPA was quite resiny though initially I found that it was a bit too boozy/syrupy. It had a solid thick mouthfeel and the flavors got more complex as it warmed up, developing a nice citrus hop flavor. Though not as impressive as Dank Williams from Cellarmaker it was still quite good for the style. 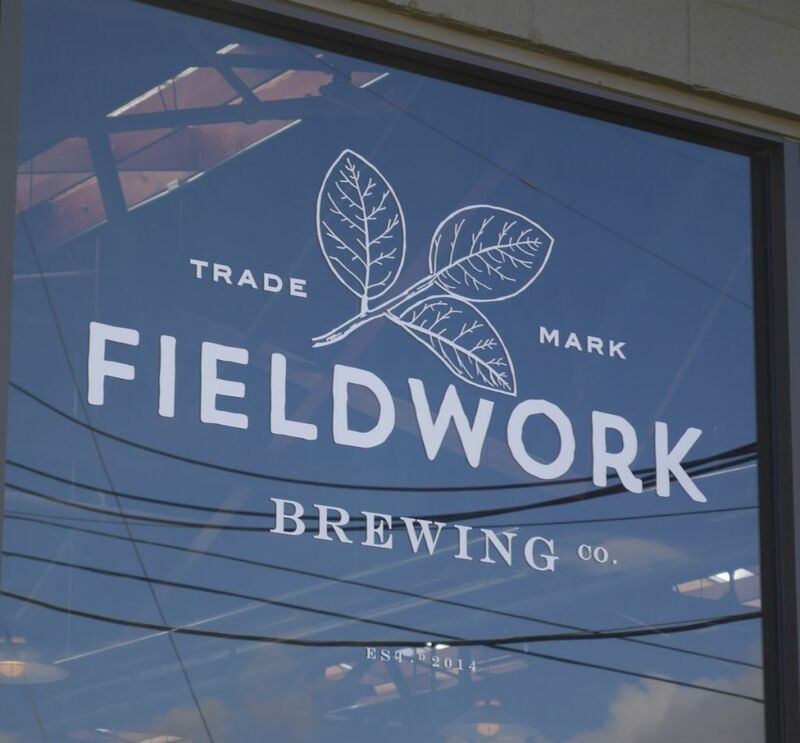 With the move towards lighter malt bills on hoppy beers, Fieldwork manages to give a unique spin on their IPAs when compared to Cellarmaker. 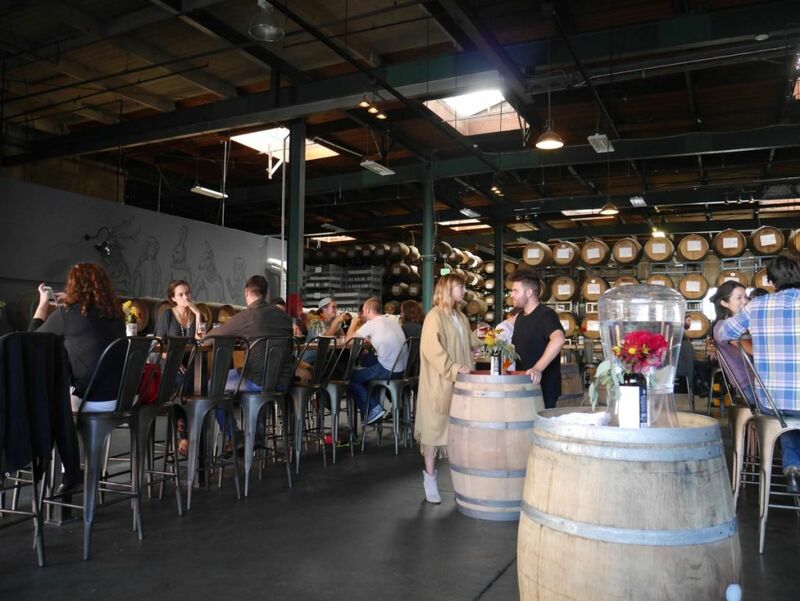 They have some nice outdoor seating areas and plenty of seating inside, while the tasting room doesn’t echo so much that it is impossible to speak. I was surprised that they used larger glasses for their tasters, perhaps for giving people full amount of aroma. Even if you don’t like hoppy beers, it is worth heading out to Fieldwork to taste the Chocolate Milk, one of the most delicious brown ales I have tasted. 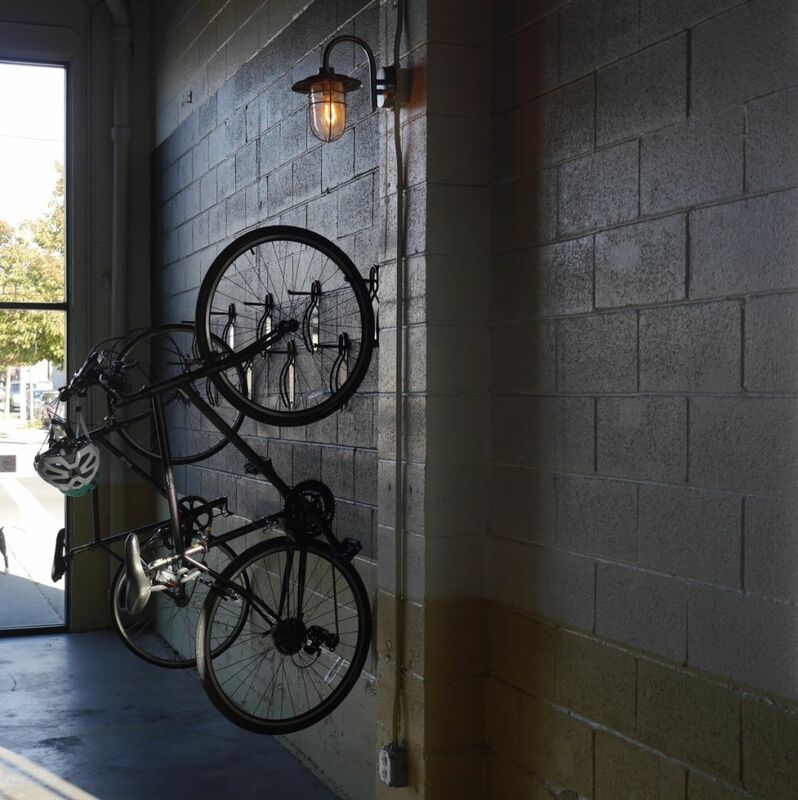 To draw a specific type of crowd they even have hangers on the wall for bikes. 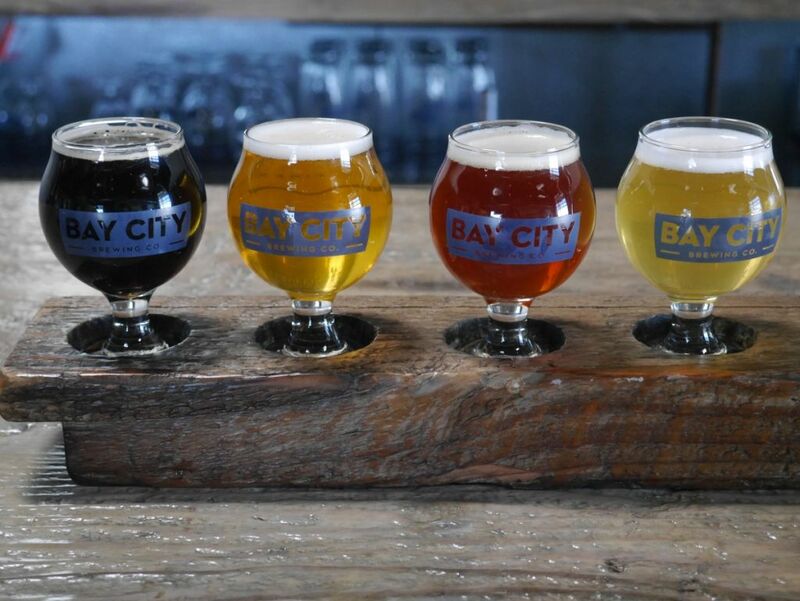 Bay City Brewing has been open for three months or so and I have heard nothing but praise for their San Diego Pale since they opened. Quite a few friends of mine have visited them with regularity whenever they can. I was excited to see what I would find when I visited on on November 15, 2015. They had a number of beers on tap but at $12 a flight of four tasters (ouch!) I only tasted four plus the additional taste the bartender passed to me. 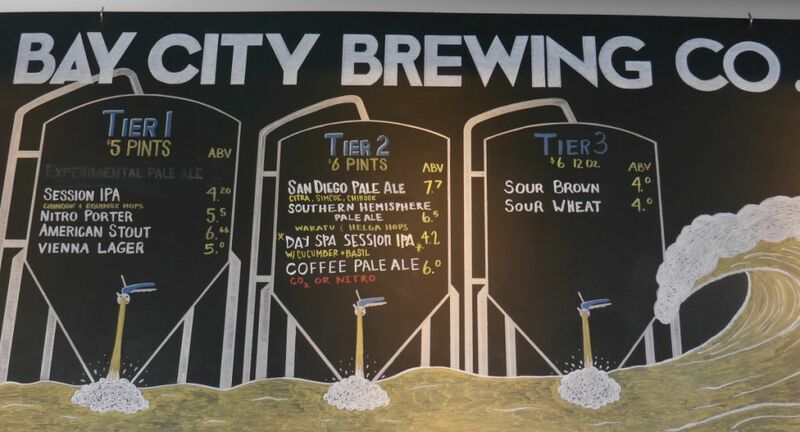 I had the stout, San Diego Pale (7.7! 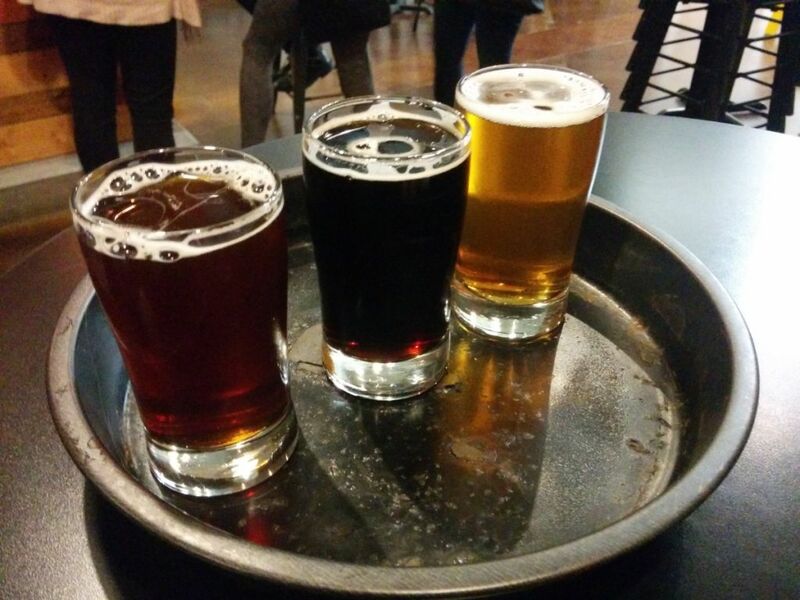 ), Sour Brown, and Sour Wheat. I also had a taste of the coffee pale ale that the bartender brought over. The stout was thick and a mix between a light smoke and a heavy roast plus some medium amount of bitterness. My husband wasn’t very impressed by it and thought it had a sour aftertaste. I found it to be a solid example of the style though I probably wouldn’t order more than a taster. The San Diego Pale was very much the typical West Coast style IPA, a mixture of fruit and citrus hops though this specific batch had a bit too much simcoe in balance to the rest of the hops, giving it a sticky sweet finish that I didn’t care for. Others came in and ordered pints without complaints so perhaps I just don’t like simcoe as much as everyone else. It is also possible that this batch turned out a little different than what everyone else was raving about, but I don’t see it. The two sours were not particularly impressive either. The sour brown they said had some sarsaparilla and bourbon chips added, which I could tell maybe two sips out of the whole taster but for most of it I got a generally off-putting sour taste that missed all of what I tend to like about sours. It may benefit from some time in a barrel aging but as it was didn’t do anything for me. The sour wheat was fairly typical to what smaller breweries have put out when doing their first berliner weisse. It was a light bodied wheat with heavy citrus punch primarily lemon. This one at least had a clear flavor that it was trying to present, though I have had better. The coffee pale ale was tasty, mixing a mildly bitter low malt pale ale with a smooth coffee. 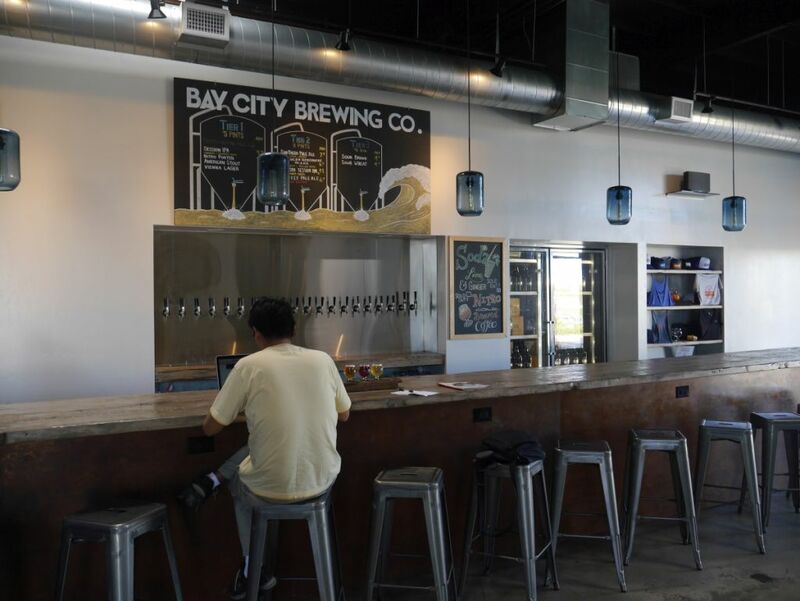 Located a good mile behind Modern Times (I expect most people will come visit them from the 5 Freeway and go past Rosecrans to get there), Bay City Brewing needs to do something unique to get people to visit them over Modern Times. I didn’t find much that stood out from them. You can also hear the cars driving by the nearby freeway while you are there, which takes away from the whole experience. Plus while I was there they had some pounding techno on in the background that I wasn’t a fan of either. 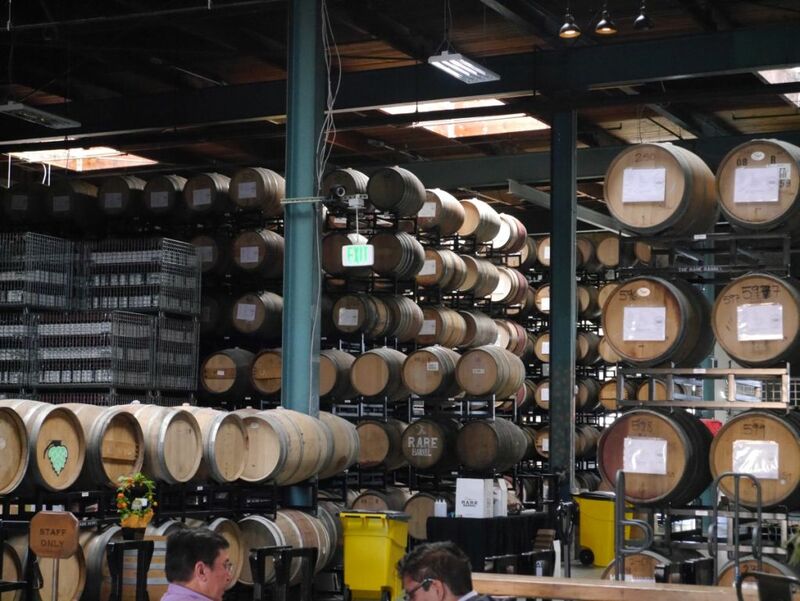 As a young brewery they certainly have some time to perfect their sours and get their San Diego Pale to be consistent but for now I don’t see much reason to visit them over Modern Times when I am in the area. 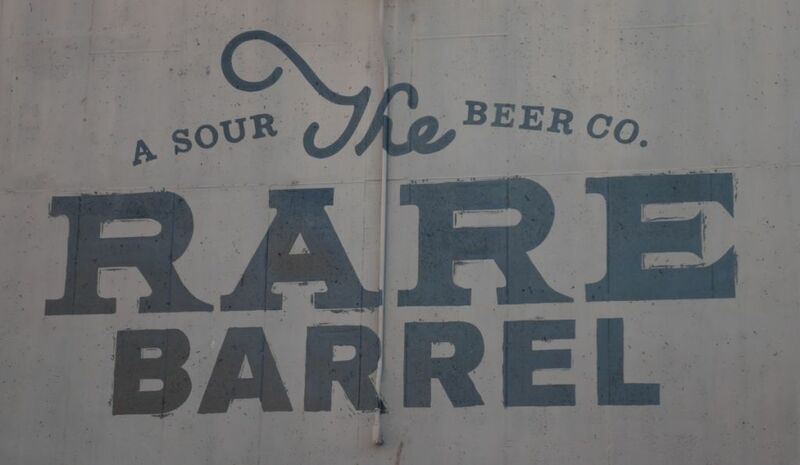 It is certainly rare to find a brewery that only brews sours. 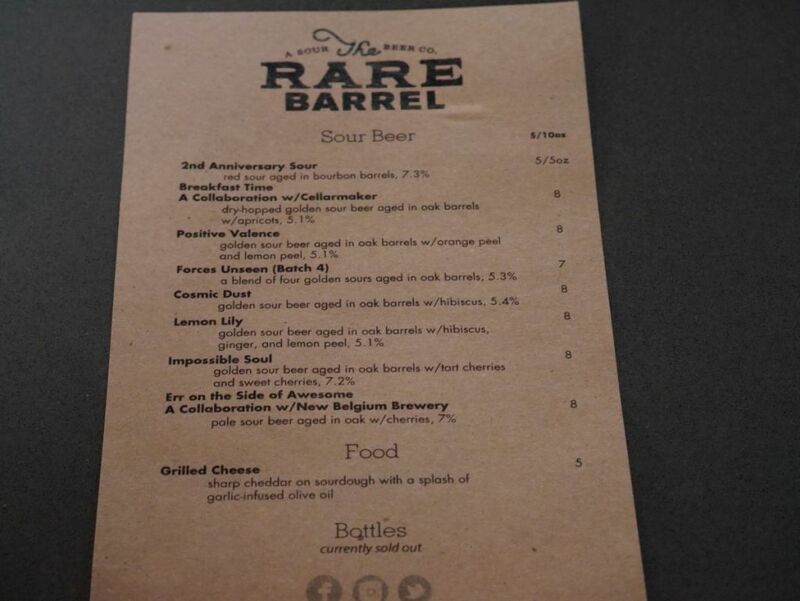 Thankfully The Rare Barrel has a few guest taps available for those who might be dragged along but don’t appreciate sours. 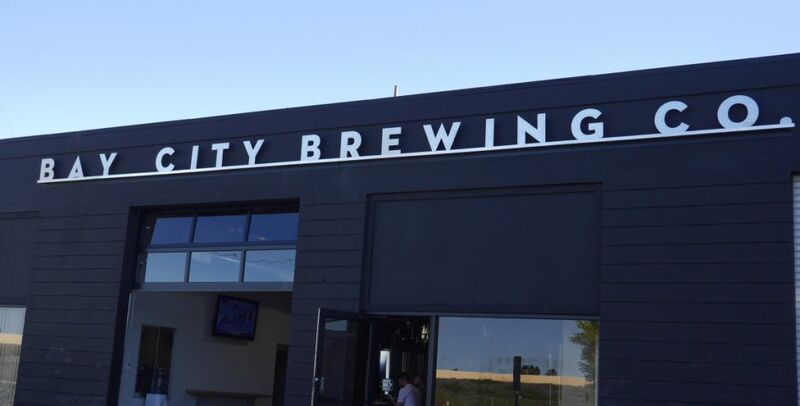 The tasting room is a bit out of the way and it is worth driving to where you think it is rather than trying to park down the street because they have a good amount of parking between the road and the front door. Probably the only major complaint they tend to receive is the lack of tasters available, which was only partially true when I visited because they did serve one beer in five ounce pours, the second anniversary beer (they had the second anniversary celebration the day before I visited). Otherwise their beers are exclusively available in 10 ounce pours for around $8 a piece. Though this seems expensive to some people it is typical for sour beers. Because they don’t offer tasters of the other beers served I only had two different beers when I visited, the Second Anniversary sour and the Impossible Soul barrel aged sour with cherries. 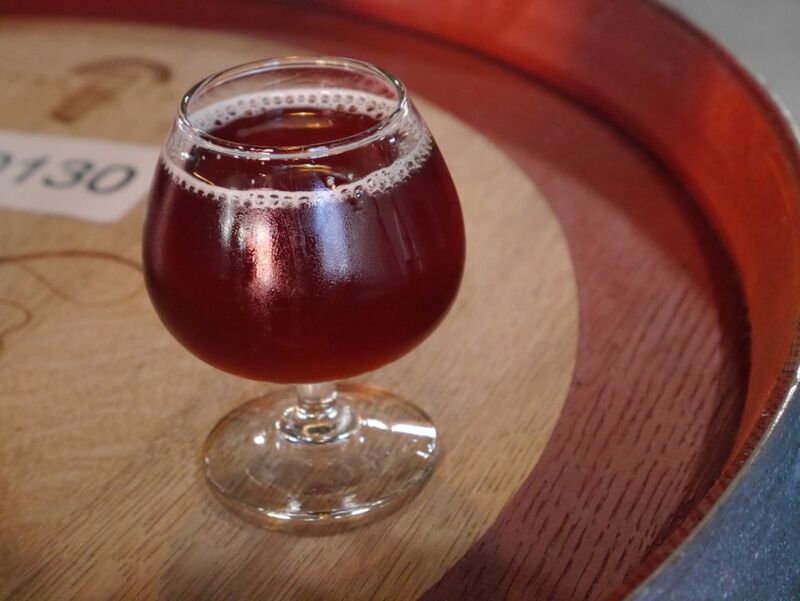 The second anniversary sour was a bourbon barrel aged red sour. It had a mild bourbon flavor and lots of smooth oak flavor that was balanced nicely with the fairly light sour kick at the end. It poured a smooth reddish brown and was a tasty sour. The Impossible Soul poured a gorgeous red/orange color and was quite smooth with a tart cherry finish. Some consider this The Rare Barrel’s version of a kriek, which is fitting. It was a bit different from other krieks though I haven’t had a ton of the style. 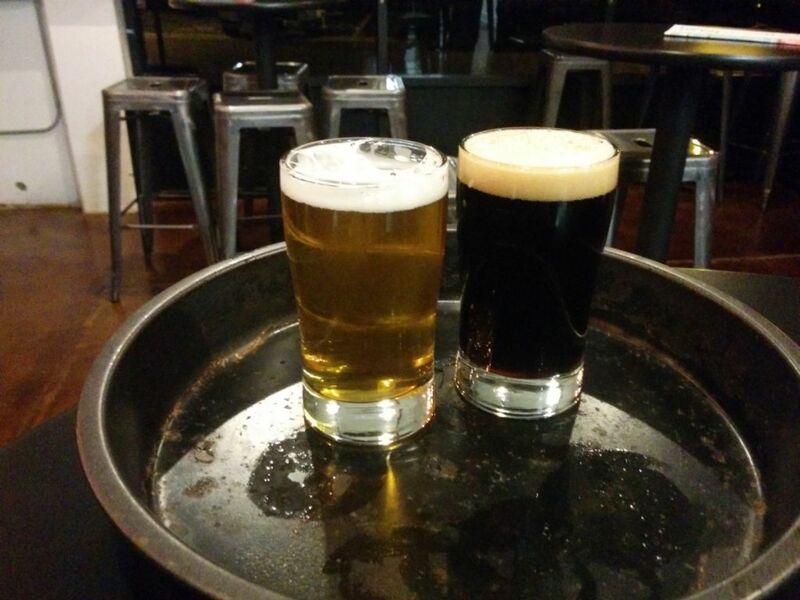 I enjoyed the two beers that I was able to taste while I was there. Besides the lack of tasters I was quite annoyed by the general loud atmosphere and poor acoustics. Though most tasting rooms tend to echo a lot this one was even more noisy than others and made it hard to relax and enjoy the beers. Part of the draw for the brewery is the exclusivity with most of the bottles and growler fills limited to members. As someone who would not want to sign up for such a thing anytime soon I thought the visit was nice but not particularly memorable. Though it is great to have a brewery that always has sours available, I found the atmosphere at Fieldwork to be more to my liking. If you know people into sours they probably would appreciate knowing when you visit as they may want you to pick up some bottles for them. Wide open tasting room with high ceilings. Massive stack of barrels aging beer. 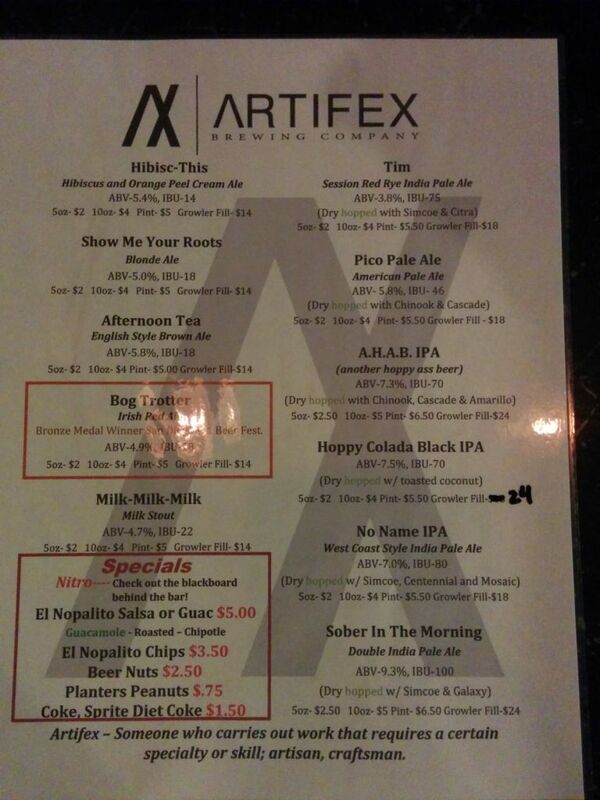 Artifex is not a brewery I expect a lot of people in San Diego will visit with the same regularity as others simply because of the long distance to get out there. 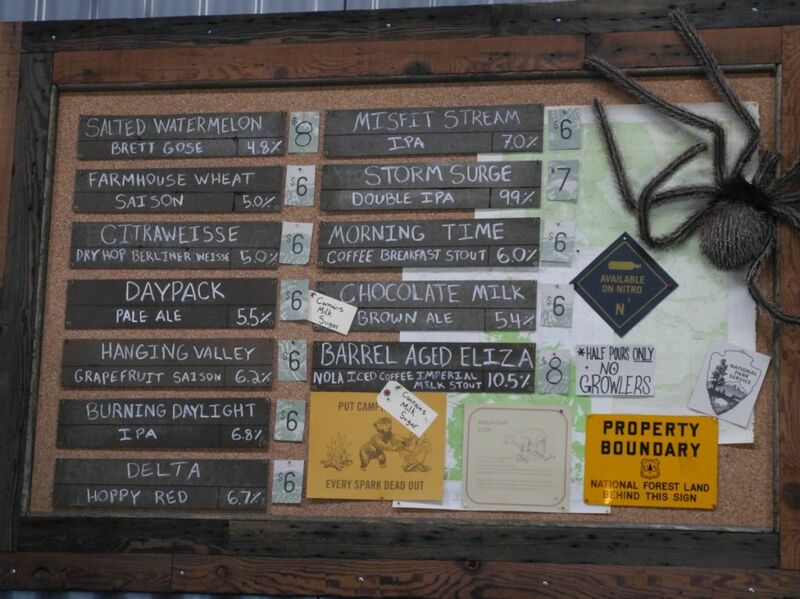 A good 30 minute drive north of Bagby Brewing, it is best visited on your way north to LA or on your way south. In this visit I happened to drive up to Orange County unexpectedly and was able to drive past Artifex on my way south for a few tasters. 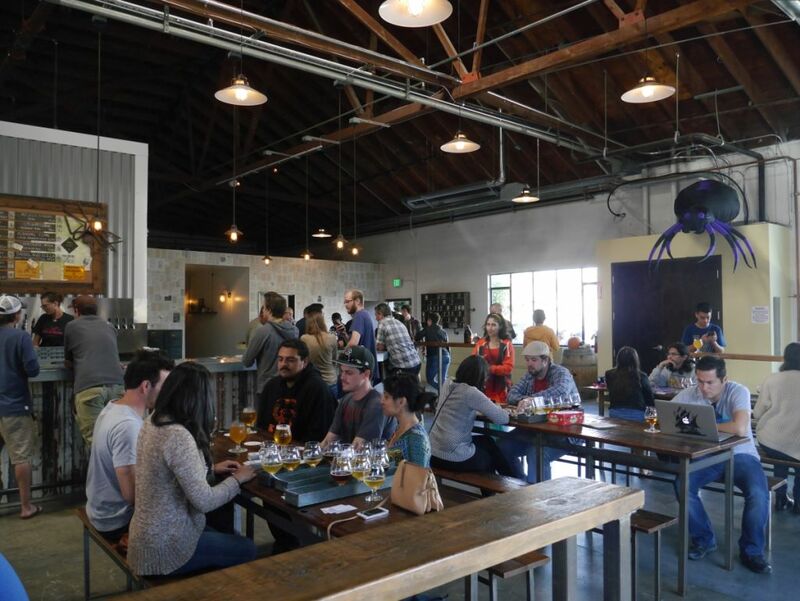 They have a typical tasting room that is a mile or so from the freeway and easy to find. They also fill blank growlers if you happen to have one with you. When I visited I tasted the Brown Ale, Milk Stout, pale ale, AHAB IPA, Coconut Black IPA, No Name IPA, and Double IPA. The brown ale was a nice medium brown in color almost dark amber and had mild flavors of caramel and English hops. The overall beer was quite tasty and easy to drink. The milk stout had a mild smoky flavor and a sticky aftertaste. The lactose was used sparingly so it did not have an intense sweetness that is typical with the style. It is a solid and tasty stout. The pale ale has a nice golden color and mixes tropical fruit and citrus with a medium bitter kick. The pale is a good example of the newer style of pale and will satisfy hop heads. 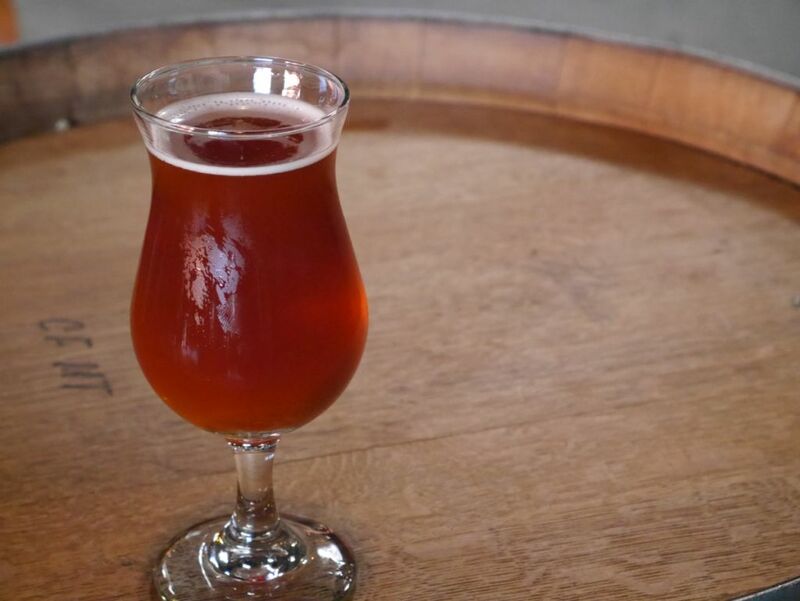 The AHAB IPA is their most popular offering and it had a nice combination of herbal and fruity hops. The beer is nice and light on the malts in the West Coast style. The Black IPA with coconut was quite delicious with an intense coconut flavor that mixes nicely with citrus hops without giving it too much bitterness. When I dropped by later for a growler of the same beer, the coconut had faded a little, leaving a more balanced mix of flavors, with the hops coming through a little more. This is still a beer primarily for hop heads. The No Name IPA had a nice intense citrus hop flavor and light malt bill. This is a seriously tasty IPA with a nice light pine and citrus hop kick while not being too bitter. There was a hint of garlic on the aftertaste but nothing that took away from my enjoyment. Finally, the double IPA was quite thick, resiny, and slightly boozy. It is a good thick beer and one you would not down very fast. The boozy kick at the back was a little much for me but it is a solid double. For a brewery that had their first anniversary in August of 2015, Artifex is brewing some delicious beers. It helps that the brewers used to brew for Pizza Port, a place well known for their delicious IPAs. For now the owners are often seen around the brewery and you will encounter a number of locals who probably come by regularly. They have food trucks most days though I happened to drop by the one day of the week when they didn’t have one. If you need a place to stop on your way through San Clemente, you should absolutely stop by Artifex.